Above, a lioness bares her teeth - it may appear aggressive, but the truth is I managed to catch her at the end of a long yawn. 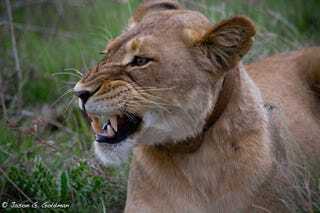 Here, the lioness - same as the one above - patiently scans a herd of zebra and red hartebeest for a tasty snack. Nambiti Game Reserve has two mature male lions; this one is called Blondie. Blondie and his brother (called Mohawk, on the left) are about four years old. The reserve is also home to three lion cubs, around three months old. Their sexes are still unknown. Their mother did a very good job of keeping them hidden, but on my last day at Nambiti we managed to catch a glimpse. Here are two of them. Their father, Bigindoda (the older brother to Mohawk and Blondie) has since been transferred to a different reserve. Reserves sometimes shift animals among them to maintain genetic diversity, not too different from the way American zoos do it. You can learn more about lion behavior in a fascinating Nat Geo WILD special featuring the three Nambiti brothers, Bigindoda, Mohawk, and Blondie, called Man v. Lion. The special launches this year's Big Cat Week on Friday, Nov 28, at 9pm. All photos were taken at Nambiti Private Game Reserve, with thanks to the guides of Lions Valley Lodge. Full disclosure: Nat Geo WILD paid for our travel and other expenses.